Zhifanggou Watershed is about 8.27 km2 and is located in the Ansai County, Yan’an City, Shaanxi Province (Figure 22). It is covered by loess soil, which is highly prone to erosion. It is in warm temperate monsoon zone with an annual mean temperature of 8.8 °C, annual accumulating temperature above 10 °C of 3170 °C, and a frost-free period of 160 days. The annual mean precipitation is about 541.2mm and about 70% of precipitation occurs in the May to October as several strong to intensive storms that induce severe soil erosion and surface runoff. As a consequence of long-term soil erosion, the land surface in this region has become very fragmented. The land surface is composed of gullies and hills, with gully density of the watershed at 8.06 km per km2. Average annual erosion rate was 14000 t per km2 before 1983, and has decreased continuously to <4000 t per km2 after 2000. There are three villages belonging to two administrative units in the watershed, namely Zhifanggou Village, Siyaoxian Village and Washuta Village. The population of the basin is 554 in 2010 with a population density of 67 per km2. Figure 22. 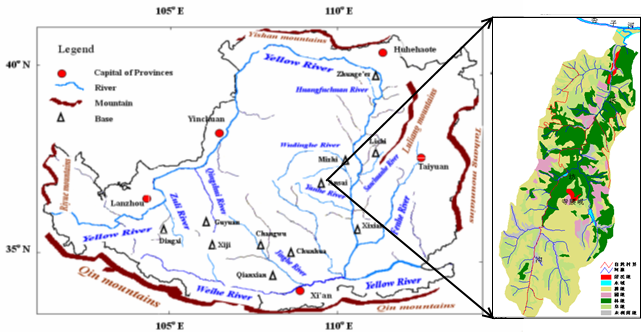 Location and characteristics of the Zhifanggou Watershed (Left: the research stations on the Loess Plateau, China; Right: the LUC map of Zhifanggou Watershed). Land use and cover conditions in the Zhifanggou Watershed are typical of this region. Farmland per capita is 4.2 Chinese mu (1 ha =15 mu), in which the high quality farmland, such as alluvial land, terraces on the slopes and the dam-lands in the valleys after long-term sedimentation in the check-dams, is more than 2 mu per capita. The ratio of agriculture, forest and livestock field is 1:1.9:2.0. The traditional crops in this watershed are maize, millet, potato, beans, and the main permanent crop is apple. The average grain yield is about 200 kg per mu, and the net income is 2,500 CNY per capita in 2010. Figure 23. Soil erosion plots in Ansai. The main soil is typical cultivated loess soils, a kind of loam soil derived from loess. The soils are fertile, but extremely susceptible to erosion. Sand, silt, and clay contents in soil profile are 65%, 24% and 11%, respectively (general properties of the loess material). The SOM is very low and ranges from 5.8 g to 13.4 g OM per kilogram of soil. Porosity of topsoil is 50% in volume and the infiltration rate of soil is fast. The main soil erosion is induced by surface flow during intensive rainfall events. The soil chemical and physical properties of different types of land in the Zhifanggou Watershed have been monitored for a long time. The main nutrient items include soil bulk density, total nitrogen, total phosphorus, total potassium, available nitrogen, available phosphorus, available potassium, SOM (soil organic matter) and pH value. Soil moisture is monitored by various methods including sampling by soil-drills, TDR and neutron probe, at different frequency from 10 minutes to half-month each time in different eco-systems. We use soil erosion plots with flow-muddy collection systems to monitor soil erosion rates from different treatments with slope, length, structure and planting system on the slopes (Figure 23). Runoff and sediment load in the Zhifanggou Watershed is monitored with a V-shaped weir in the lower stream of valley. The LUC change process, input and output of crop land including labour, fertilizers, yields and natural disasters are monitored as social and economic aspects of land management and soil quality improvement practices. NGOs: Ansai Agriculture Broadcast School, Ansai Science and Technology Association, and Elementary school of Siyaoxian, Ansai, etc. Researchers and students from Chinese Academy of Sciences, Minostry of Water Resources, Ministry of Education, etc. Fei W, Rui L, Feng J, Qingke Y, Junliang T. 2005. 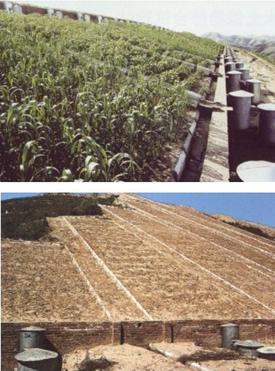 Cropland conversion and its environmental effect in the Loess Plateau, China —a pilot study based on the national experimental bases. Journal of Geographical Sciences 15: 484-490. Wang B, Liu GB, Xue S, Zhu BB. 2010. Changes in soil physico-chemical and microbiological properties during natural succession on abandoned farmland in the Loess Plateau. Environmental Earth Sciences (in press). DOI: 10.1007/s12665-010-0577-4. Dai QH, Liu GB et al. 2007. Dynamics of soil water stable aggregates and relationship with soil properties on abandoned arable land in Eroded Hilly Loess Plateau. J. Soil Water Conserv. 21: 61–65. Zhou P, Liu GB. 2009. The change in values for ecological footprint indices following land-use change in a Loess Plateau watershed in China. Environ. Earth Sci. 59: 529–536.